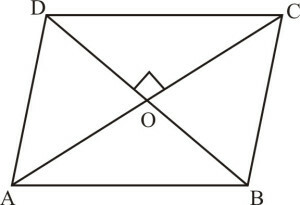 Q.1 Sides of triangles are given below. Determine which of them are right triangles. In case of a right triangle, write the length of its hypotenuse. So, the triangle with the given sides is a right triangle. 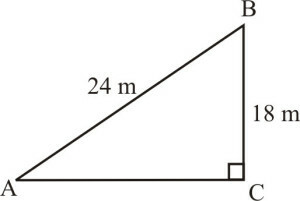 Its hypotenuse = 25 cm. So, the triangle with the given sides is a right triangle. Its hypotenuse = 13 cm. 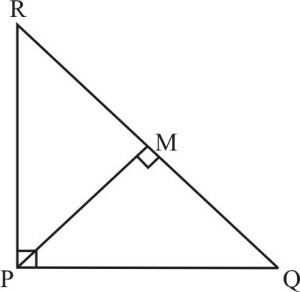 Q.2 PQR is a triangle right angled at P and M is a point on QR such that . Show that . 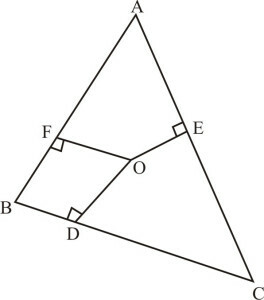 Given : PQR is a triangle right angled at P and . 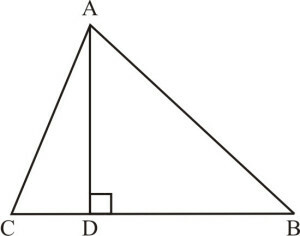 Given : ABD is a triangle right angled at A and . 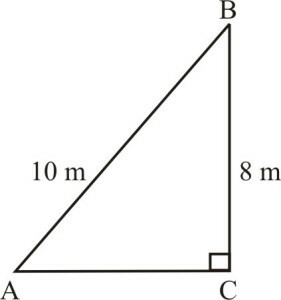 Q.4 ABC is an isosceles triangle right angled at C. Prove that . 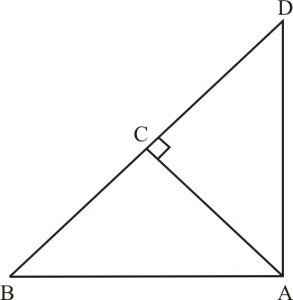 Since, ABC is an isosceles right triangle, right angled at C.
Q.5 ABC is an isosceles triangle with AC = BC. 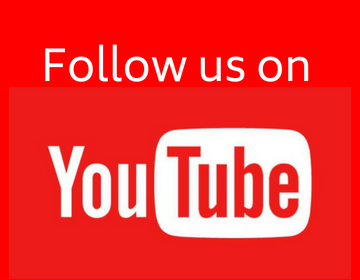 If , prove that ABC is a right triangle. Therefore ABC is right angled at AC. 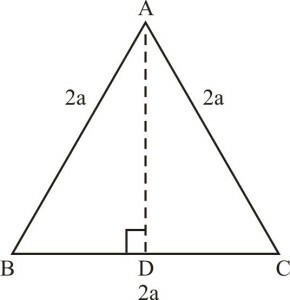 Q.6 ABC is an equilateral triangle of side 2a. Find each of its altitudes. Let ABC be an equilateral triangle of side 2a units. Draw . Then, D is the mid-point of BC. 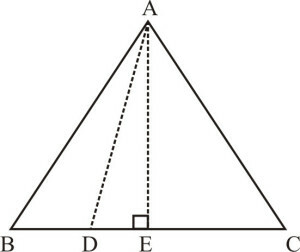 Since, ABD is a right triangle, right angled at D.
Therefore each of its altitude = . Q.7 Prove that the sum of the squares of the sides of a rhombus is equal to the sum of the squares of its diagonals. 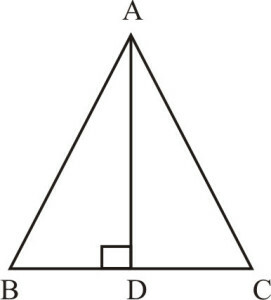 Let the diagonals AC and BD of rhombus ABCD interesect each other at O. 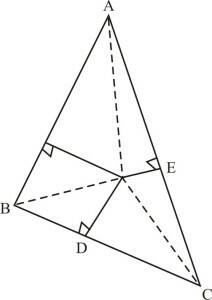 Since the diagonals of a rhombus bisect each other at right angles. Since, AOB is a right triangle, right angled at O.
Q.9 A ladder 10 m long reaches a window 8 m above the ground. Find the distance of the foot of the ladder from base of the wall. Let AB be the ladder, B be the window and CB be the wall. 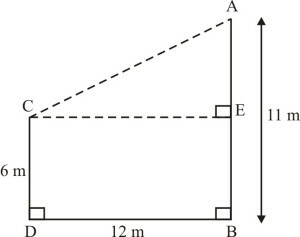 Then, ABC is a right triangle, right angled at C.
Q.10 A guy wire attached to a vertical pole of height 18 m is 24 m long and has a stake attached to the other end. How far from the base of the pole should the stake be driven so that the wire will be taut ? Let AB (= 24 m) be a guy wire attached to a vertical pole. BC of height 18 m. To keep the wire taut, let it be fixed to a stake at A. 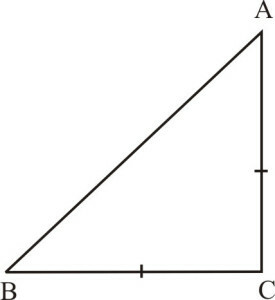 Then, ABC is a right triangle, right angled at C.
Hence, the stake may be placed at distance of m from the base of the pole. Q.11 An aeroplane leaves an airport and flies due north at a speed of 1000 km per hour. At the same time, another aeroplane leaves the same airport and flies due west at a speed of 1200 km per hour. How far apart will be the two planes after 1½ hours ? 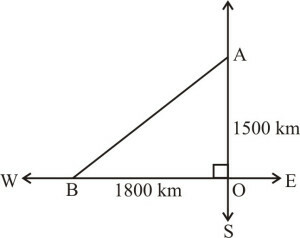 Let the first aeroplane starts from O and goes upto A towards north where km = 1500 km. Let the second aeroplane starts from O at the same time and goes upto B towards west where km = 1800 km. According to the problem the required distane = BA. Q.12 Two poles of heights 6 m and 11 m stand on a plane ground. If the distance between the feet of the poles is 12 m, find the distance between their tops. 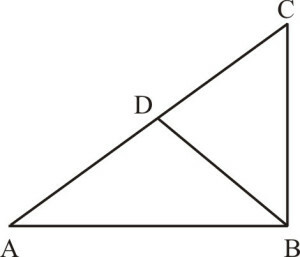 Let AB = 11 m and CD = 6 m be the two poles such that BD = 12 m.
AE = AB – BE = AB – CD = (11–6) m = 5 m.
Q.13 D and E are points on the sides CA and CB respectively of a triangle ABC right angled at C. Prove that . 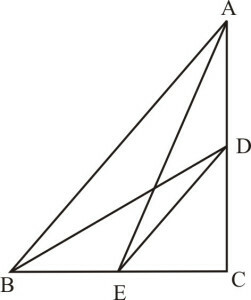 Q.14 The perpendicular from A on side BC of a intersects BC at D such that DB = 3 CD (see figure). Prove that . Therefore is an acute triangle. , which is the required result. Q.16 In an equilateral triangle, prove that three times the square of one side is equal to four times the square of one of its altitudes. Let ABC be an equilateral triangle and let . Thus, is a right triangle, right angled at B.